Minister of Business, Dominic Gaskin signing a three-year agreement of cooperation on oil sector development with the Minister of Natural Resources of the Canadian province of Labrador and Newfoundland, Siobhan Coady. 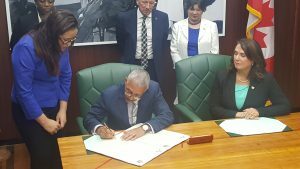 Guyana and the oil-rich Canadian province of Labrador and Newfoundland on Monday inked a three-year agreement of collaboration in “support of responsible oil and gas development opportunities”. 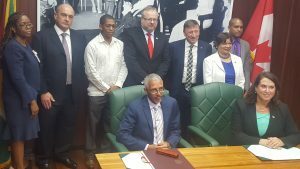 “The parties will facilitate economic cooperation and business opportunities in Guyana and in Newfoundland and Labrador by organising reciprocal visits to the other jurisdiction that include representatives of industry and government,” the agreement states. Specifically, the agreement provides for the two sides to collaborate in support of business opportunities in the oil and gas industry offshore Guyana and Newfoundland and Labrador, including supply chain development, joint ventures and exchanges, knowledge transfer, technology development, training and health, safety and the environment initiatives that may also benefit other sectors. At the same time, the agreement does not prevent Guyana and that Canadian province from conducting activities that are in their best interest. “Parties to this agreement will continue to have the ability to independently determine their own domestic objectives or priorities. Collaboration under this agreement and the work plan will be realised in accordance with the laws, regulations and policies of each jurisdiction,” the agreement states. According to the deal at the Ministry of the Presidency were Minister of Business, Dominic Gaskin and that Canadian provincial minister of Natural Resources, the two sides have 30 days from the date of signing to develop an annual work plan. Minister of Business, Dominic Gaskin and the Canadian provincial Minister of Natural Resources, Siobhan Coady after signing the agreement. Those standing include Director of the Department of Energy, Dr. Mark Bynoe (second from left) and Canada’s High Commissioner to Guyana, Lilian Chaterjee (extreme right). Chairing the Working Committee will be the province’s Deputy Minister of Natural Resources, supported by the departments of tourism, culture, industry and innovation and other appropriate departments, and Guyana’s Director of the Department of Energy, Dr. Mark Bynoe who will be supported by supported by other departments and agencies. Quarterly communications are expected to be held by the co-chairs and with relevant industry groups and non-governmental organisations. The agreement notes that the provincial government supports “an environmentally responsible, globally significant oil and gas industry offshore Newfoundland and Labrador including a world-class supply chain”. “I know that one of the things that we in Newfoundland and Labrador did in our early days of developing our offshore oil and gas industry was work with joint ventures and others that had had that experience so that we could develop and do that knowledge transfer and that’s what we are here to work with you to give you the experiences that we have so that you can build and grow your opportunity here in Guyana,” the Canadian Minister of Natural Resources said. Signing of the agreement was witnessed by officials of the Ministry of Foreign Affairs, the Canadian High Commission and the Ministry of the Presidency’s Department of Energy.